You work hard and you require a work boot designed to fit your lifestyle. After all, these are your feet, so take care of them. 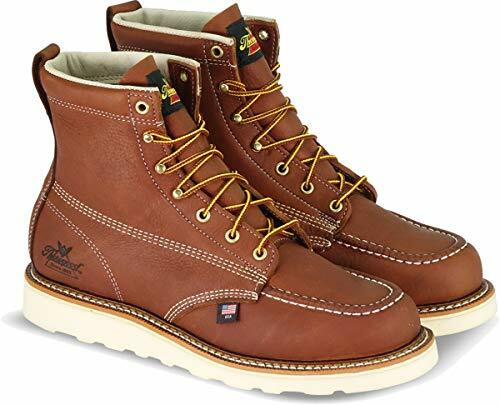 Thorogood is a well-known name brand work boot, made in the USA and crafted with only the highest quality materials. They have been in the business of making comfortable, durable work boots for over 100 years. Whether you’re an construction worker or weekend hiker, you can be sure your feet are taken care of in Thorogood boots. This boot is designed with numerous top quality features; providing additional comfort during long days on the job. The combination zipper with Velcro inserts and lace-up feature allows for ease in removing and adjusting the boot fit. A cushion and shock absorbing midsole composite shank, keeps your feet pain-free during extreme working environments. In addition, a slip-resistant, non-marking outsole keeps you steady on your feet. Be sure to check out our other top picks for Best Police Boots. Gen Ex Dual Density Rubber Lug Outsole is mark-resistant and prevents slippage and added traction to remain steady on your feet. EVA Cushion and FlexShock Absorbing EVA Composite Shank provide long lasting comfort throughout the day. Boots have a short break-in time and you can wear them right out of the box. Extremely lightweight at only 1.5 lbs. The zipper tends to cause some rubbing on the ankle, but thicker socks can alleviate that. 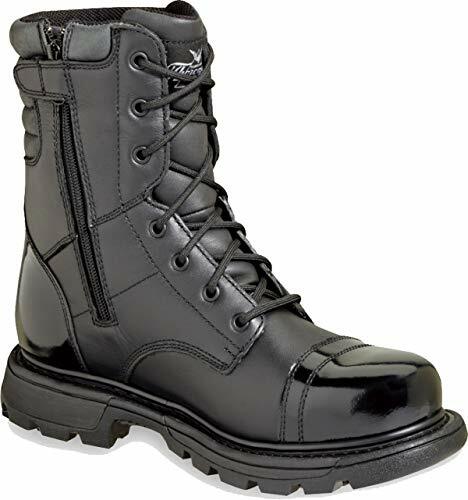 After this Thorogood boot review, we concluded that for the money, you are getting comfortable work boots with several features designed for comfort and durability on the job.Though leather is not one of the main components of this boot, it is designed to accommodate the needs of those working in the public safety field, such as EMT’s and police personnel. We would not recommend this boot for heavy construction or industrial work, as they require a boot with additional safety features. This sharp rugged boot feature in rich Tobacco colored leather and contrasting stitching is meant for tough working individuals, who require extra protection from a steel toe boot. An electric shock resistant, slip resistant, thick sole provides additional safety and stability, allowing you to feel confident and secure on your feet on the job site. In addition, the extra ankle support accompanied by an adjustable, secure lacing feature is adaptable to your needs. Equipped with removable shock absorption insert, and comfort cushion enables periods of long wear with ease. We believe these work boots are worth every penny and found it extremely difficult to find many faults with them. These boots are specifically designed for engineering and construction jobs, especially electricians. Added safety features, along with comfort and durability make these boots a must have in the field. Rest assured, we have done our homework and our verdict is – we highly recommend these work boots. 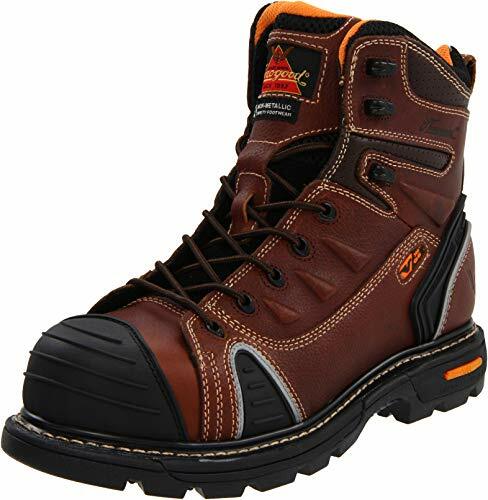 A sporty, outdoorsy look is associated with these composite safety toe work boots. They feature an abrasion resistant toe and side bumpers, making it virtually impossible to leave marks. Ideal for work and play, these boots are tough enough for the job and comfortable enough for everyday use. The compression-molded gel inserts and cushioned footbed allow for shock absorption and comfort all day long. These boots hold up during the most extreme circumstances, for long periods of time. Stitching tends to come unraveled after a period of time, causing the rubber toe bumper to loosen or come off; keep in mind, this boot is not for rigorous outdoor activity. Laces can break easily if pulled too tight, however, by tightening laces from the bottom up alleviates the pressure from pulling from the top. Though we find that the overall look of these boots is fantastic, there might be some issues with utilizing these boots for hard labor. 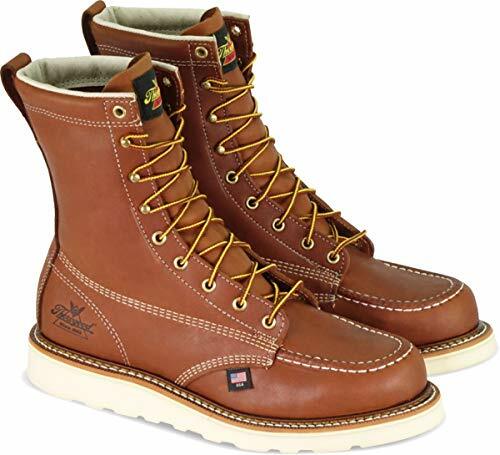 Generally speaking, we believe these boots are great for those who are in less rigorous outdoor lines of work, and would make an excellent purchase for someone who works in a warehouse where the terrain is not so rough. 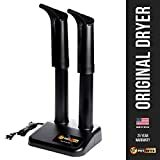 Additionally, a casual hiker would probably enjoy the flexibility and the look of these boots, especially with the slip resistance technology. These shock absorbing boots offer comfort in every stride. Avoid bumps and painful stubs with the protection of the Moc safety toe. In addition, the fiberglass shank offers support and stability. A rubber wedge outer sole provides traction when you need it while remaining sure-footed without worrying about a slip. This stylish looking boot is featured in oil tanned leather and designed for the working man. After careful analysis of these boots, we believe they are a good buy. They are designed tough, and the additional safety features allow this boot to be used by construction workers, electrical engineers, and industrial employees. Though the boots do lack in the lining department, additional socks could be worn to alleviate any discomfort. These boots are easily broken in and they are comfortable as soon as you put them on. Size seems to run regular with the exception of the lack in toe room. But overall, it’s a great boot for the money. In addition, we have a list of best boots for electricians. We strive to only list the most top-rated brands out there and avoid the rest. Thorogood brand boots are just one of them, deserving of recognition. Reading our honest Thorogood boots reviews page is the only way that you’ll know for sure that you’re getting what you need in a boot. Our reviews are 100% honest and we thoroughly research each brand we put out there. So, whether you are looking for a military boot, a waterproof work boot, or requiring a more durable and safety rated boot for your job, rest assured, you are getting only the facts and know that Thorogood boots do stand up to their reputation of being dependable, durable, and comfortable.